As promised, we get a bit of a lighter tone in season 4 as we open up the episode with Barry doing his Risky Business dance to make a huge breakfast and catch up on all of the TV he’s missed while in the Speed Force. Barry gets called away to a crime scene while Iris stays behind to do some wedding planning. However, Barry happily informs Iris that he has made most of the decisions like the caterers and the flavour of the wedding cake. When Barry arrives at the crime scene is to find billionaire Kurt Weaver remains splattered all over an elevator. Cisco arrives and finds some weird code in the elevator indicating it was hacked. By the way, the apartment that Weaver was looking at looked an awful lot like Felicity’s apartment. Back at STAR Labs, Cisco introduces Barry to his new suit and the manual that comes in it. When Barry and Iris start making dinner plans, she is dismayed that he cancelled a schedule training session. 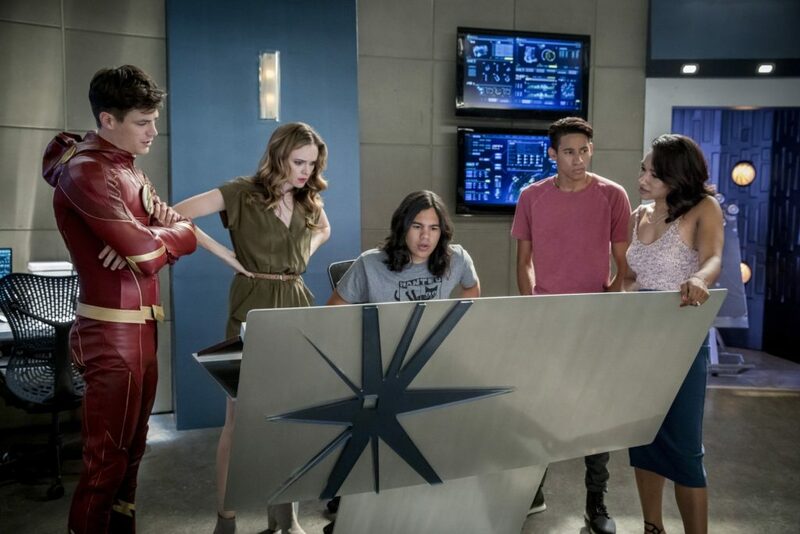 Caitlin notices that Iris and Barry have been out of synch since he’s come back and suggests the two go to couples therapy as it helped her and Ronnie. Iris thanks Caitlin for the suggestion but doesn’t think they need it. The team gets alerted to an unauthorized breach and just before Caitlin goes to help Iris, she briefly flashes as Killer Frost but manages to keep her under wraps. But the team have no need to worry as it is Gypsy who emerges ready for her date with Cisco. However, Cisco postpones their date as he is busy trying to find the hacker. Things get more complicated when another attack happens. This time it is Tim Quan, another billionaire whose car gets hijacked. Barry flashes to the rescue but ignores all of Iris’ instructions thinking he knows best and it almost results in Tim getting killed. When Barry returns to STAR Labs, the note the same code. Cisco can’t crack the code until Caitlin figures out that the hack has DNA in it and they realize a meta human is behind the hack. Cisco also figures out a connection between the victims. It is Ramses Deacon who worked with Quan and Weaver to develop an app called Kilg%re that made the latter billions because they stole the tech from Deacon. Unfortunately for Quan, Deacon hacked a police robot to drop a grenade during his interview with Joe. This forces Joe to call for Barry. This ends being bad timing as Iris, taking Caitlin’s suggestion to heart, convinced Barry to go to couple’s therapy. The two go through all that has happened to them in first three seasons but before they can talk more, Barry is called away. Before their therapist arrives, Barry notices a newspaper article where the headline reads “Mayor Queen is the Green Arrow”. When Barry arrives to CCPD, he manages to save Quan and Joe. The team realizes that another person is Deacon’s next target so Wally and Joe go to protect Sheila Agnoti. Unfortunately, Deacon does get to Sheila and uses her electronic insulin pump to put her in insulin shock. Wally manages to save her and Sheila tells him and Joe that Deacon has taken Quan, who came by to warn her. Back to Barry and Iris, she managed to get another session and the two finally get down to what is bothering them. Iris tells Barry how she didn’t appreciate him cancelling their training session as well as making wedding plans. Finally, Iris tearfully confesses how Barry leaving broke her heart. Meanwhile, Cisco has been trying to figure out how to stop Deacon’s powers and cancels his date with Gypsy. Cisco thinks everything is cool as Gypsy was okay with it. However, Caitlin tells Cisco that isn’t the case. Later, Cisco gets Gypsy to open up at what is bothering her. Gypsy confesses that she wanted to have their date today because on her it it is 111 Day which sounds an awful lot like Valentine’s Day. Cisco apologizes and promises to make it up to her. Also, 111 Day gives Cisco an idea on how to stop Deacon. And just in time too as we see Quan confess how he and Weaver ripped off Deacon. Just before Barry goes off, he and Iris have their talk. Iris confesses it was hard lying to friends and family why Barry left. Iris knew what the optics would look like to others and what that would say about her and Barry. Barry confesses that he has to put the weight of the world on his shoulders as he is the Flash but Iris corrects him and says they are the Flash. Barry and Wally arrive to where Quan is being held. The device that Barry has is supposed to scramble Deacon’s DNA so he can’t use his powers. Unfortunately because the Flash new suit is teched up to the hilt, Deacon uses it to his advantage to make it go all haywire that includes using the built in weapons to blast away Wally. Deacon cuts off the coms and this forces Barry to use a pay phone to call STAR Labs. And to comic effect, we see the suit inflate. Eventually, the self-destruct button is activated and Iris suggests that Barry throw a lightening bolt at himself to stop it. Luckily it works and Barry manages to stop Deacon from killing Quan. Back at STAR Labs, Cisco puts on the romance to have the long-delayed date with Gypsy. And at Iron Heights, Joe and Barry visit Deacon and asks how he got his powers since he wasn’t in Central City during the particle accelerator explosion. Deacon doesn’t say but indicates other are coming and it looks like the warden of Iron Heights might be in on it. In the coda, we see the Mechanic talk to the Thinker to let him know that Deacon is in captivity as planned. The Thinker is ready to find the others who at the moment their identities remain an mystery.